Middle East media is having a fake news moment. At least four Arab states have blocked access to Qatari media, including international news channel Al Jazeera, in response to a disputed report about Iran. The spat began earlier this week when the official Qatar News Agency ran a report quoting the Emir of Qatar making favorable comments about Iran and criticizing President Trump's hardline policy towards Tehran. "There is no wisdom in harboring hostility towards Iran," Sheikh Tamim bin Hamad Al Thani was quoted as saying. Qatar said the news agency had been hacked, and that the report quoting the emir was "fake news." Some of Qatar's neighbors did not buy that explanation. Saudi Arabia, Iran's rival in the region, and the United Arab Emirates were quick to block online access to Al Jazeera, which is owned by the Qatari government. Egypt and Bahrain followed suit late Wednesday. Other Qatari newspaper websites were also blocked. Al Arabiya TV, backed by Saudi Arabia, carried a video Wednesday it claimed proved that the news agency report was correct, including a clip it said was from Qatar TV showing an onscreen banner with the contentious remarks. Just a few hours later, Qatar TV hit back with a special late night show called "The Truth." "Al Arabiya said they will air the clip of the recording, why didn't they?" said the head of Qatar TV, Abduallah Al Athbah. "Because it doesn't exist. It's not real." The Gulf states have been at odds with Iran over its role in regional conflicts such as the wars in Syria and Yemen. They often criticize the Islamic Republic for meddling in the affairs of other countries. Media commentators in the region criticized Qatar this week for breaching that collective stance against Iran. Qatar's relationship with Iran is complex. It shares the largest gas field in the world, South Pars, with Iran. Thanks to that field, the tiny state has become the world's leading exporter of liquefied natural gas. Qatar News Agency's website in English and Arabic has been offline since Wednesday. The hashtag, Tamim's remarks (in Arabic), has been trending on Twitter in the region. Qatar's foreign ministry said in a statement that it had regained control of the website but continued to face attempts to hack its social media accounts. It said it was investigating but gave no indication who it thought might be responsible. Foreign minister Mohammed bin Abdulrahman Al-Thani said he was "surprised" that some media continued to report "fake news." The spat between Qatar and its neighbors comes just days after Trump's visit to Saudi Arabia. Trump was fiercely critical of Iran during a speech in Riyadh. He blamed the Islamic Republic for training terrorists and militias and said it was responsible for spreading "destruction and chaos across the region." 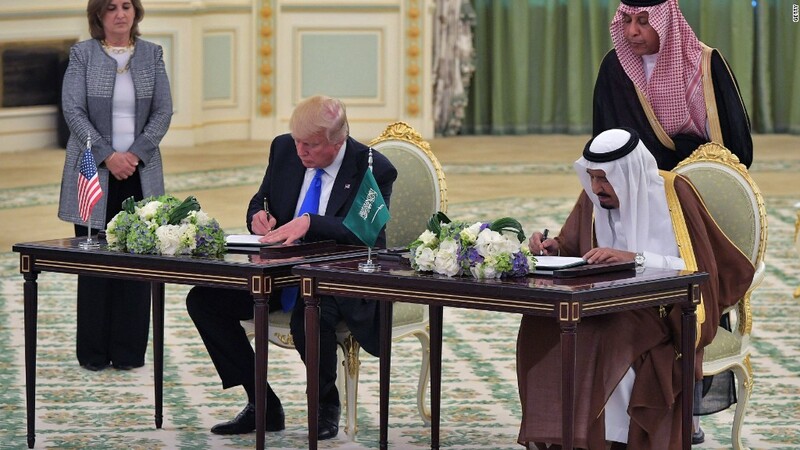 He signed a huge weapons deal with Saudi Arabia. The disputed Qatar news agency report also called on the United Arab Emirates and Bahrain to "review its stance against Qatar." Relations between Qatar and other Gulf states cooled in 2014 over Qatar's foreign policy and its links to the Muslim Brotherhood, a political and social organization that calls for a society based on Islamic law.